The Library-Archives Division collects, preserves, and makes available both published and unpublished materials about the history of Wisconsin, the United States and Canada. The Library and Archives also serves as the North American history research center for the University of Wisconsin-Madison and provides access to collections owned by the Wisconsin Center for Film and Theater Research. Collection strengths include United States and Canadian history and genealogy, Wisconsin history, and a newspaper collection second only to the Library of Congress. Collection strengths include Wisconsin history and the history of mass communications, social action, and organized labor. The archives is home to the Society's map and atlas collection as well as audio, film, and photographs. 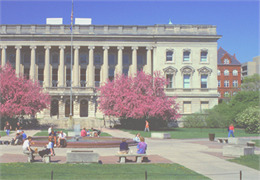 The Society's library and archival holdings are cataloged in the University of Wisconsin-Madison's library catalog. Find books, newspapers, maps, government publications, manuscripts, photographs, government records, audio and more. These finding aids (registers) describe archival resources held by 19 repositories throughout Wisconsin. Find collection guides and indexes. Family History Research Use our online tools for your genealogy research or visit us and we can help. Learn about the collection areas of the Wisconsin Historical Society's Library-Archives. This division collects, preserves and makes available materials about the history of Wisconsin, the United States and North America. Get access to records and moving images documenting the history of the American film industry, popular theater and television. Find your ancestors among our 3 million digitized family history records. Investigate more than 12 million documents, publications, photographs, films or items dating from 1753 to 1985. Explore more than 25,000 maps of the United States and Canada, most predate 1900. See more than 75,000 digitized photos, drawings, paintings and other materials. The Library has a wide array of materials published by the governments of the United States, Canada, Wisconsin and most other states in the union. Some books, agency reports, statistical abstracts and legislative journals date back to the 1790s. The Archives has original historical records from schools and school districts, towns, counties, state government and agencies, the governor's office and the court system. Some records date back to 1821 when Wisconsin was still part of the Michigan Territory.